There’s nothing more satisfying then cruising around in your bright, shiny spotless ride and having heads turn left and right, admiring your vehicle. In this article, we’ll outline what to look for in a car wax and which ones we recommend. Updated June 2018: added another recommendation and provided some more information on usage. Waxing your vehicle is something that many folks might think is unnecessary – something only guys that are really serious about their cars use, or folks with vintage vehicles. You’ve maybe never waxed your car before, but it is an important and often overlooked maintenance item for your vehicle. In this guide, we’re going to show you the advantages of waxing your car. After we explains the pros and cons, we’ll be taking a look at these four products to help you decide which one best suits your needs. Older vehicles used to be painted with just two layers of paint, a primer and the actual colored lacquer, but that was it. The wax was the only thing protecting the paint job from your dad’s Mustang. 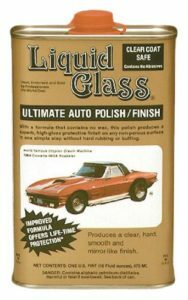 Around the 1980s, car manufacturers started using an additional layer of clear paint coat, sealing in the colored lacquer making it nice and shiny and also providing a little extra protection from potential damage from UV light, ozone, exhaust, car wash detergents, rocks, insect splatter and bird poop. But, even this protective clear coat can deteriorate over time, and you’ve likely seen the effects of this. Waxing your vehicle regularly will help negate this effect over time, keeping your ride looking shiny and new for years to come. Ideally, you should wax your car at least twice a year, although that’s something that probably doesn’t end up happening. Like we said, it’s an important part of maintenance that gets overlooked. Now that you know what you need to accomplish, let’s take a quick look at our five favorite options. First, we’ll go in-depth and look at them one by one. After, we’ll give you some more information that will help you decide what’s right for you. ✔ Apply however you like: with a polisher, by hand, or using an orbital! 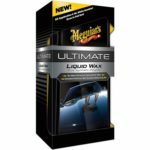 Our top choice for synthetic is Meguiar’s Ultimate Liquid Synthetic. This is another great synthetic treatment for your vehicles that will leave them looking brand new. The shine is impressive, and it’s extremely easy to apply, since it’s so thin. 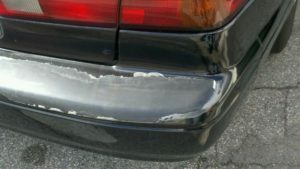 It doesn’t leave any streaks, so even if you get it on your black plastic trim it wipes up cleanly. Not only does it produce a great shine, but also a great protective coating that protects against UV damage and other environmental factors, for about 6-8 months. It’s awesome for black cars too, giving a beautiful deep polish and removing any of that grey haze that can develop. It works great with all other colours too. ✔ Extremely safe, helps to protect your paint. Ideal for anyone who has invested in their car. Liquid Glass, our runner up, is considered one of the most trusted brands of synthetic paint sealant. Because it’s not technically a wax, it’s extremely very easy to apply. It’s more of a polish than anything, really. Because it’s a fairly thin liquid, it takes almost no effort to work it into your vehicle using a buffing cloth. 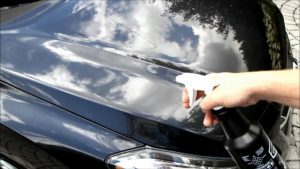 Once it dries, it produces a hard, clear protective coat over your vehicle’s exterior. The shine is also impressive, while not quite as shiny as a carnauba it will definitely have people turning heads. It won’t leave residue like some waxes, and doesn’t need to be treated/removed before applying an additional coat or when removing the excess. This is a very versatile treatment and will look great on all colours of cars, making reds and blues pop and also giving black cars that amazing shine. It’s also one of the longest lasting treatments you can get, giving you around 6-8 months of protection (although this can be affected by a number of different factors). It also works great on boats. Good For: Black, red, blue or other coloured vehicles. Long lasting, easy to apply. If you’ve spent any amount of time shopping around for a new wax, then you’ve surely heard of this brand. 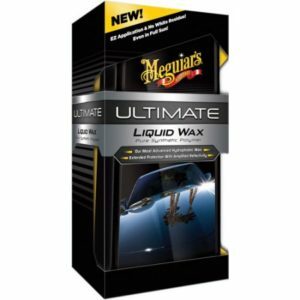 Meguiar has a variety of waxes, polishes, and other products on the market, but not many are familiar with this one. Sure, this might not be our first recommendation for a show car. 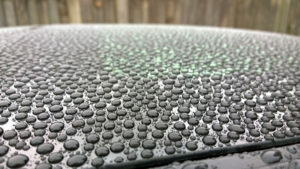 After all, there are very few products that can match a professionally polished car topped off with a fine carnuba wax. But those kinds of products require a lot of work an maintenance to look that way! Where quick wax stands out is in the ease of use department. It’s just a simple matter of giving your car a quick spray and wipe down after your regular wash. This is ideal for the average joe who doesn’t plan on detailing his car every weekend, but still wants something that looks great. This spray wax is both effective, and easy to use. If you’re looking for a quick fix, this is the first place we’d start. ✔ Doesn’t have to be stripped next time you wax – simply refinish the surface. If you’ve decided that you prefer the classic carnauba wax route as opposed to synthetic, then Gold Class is the gold standard to go with. Gold Class is slightly thicker/stiffer than some other brands you can get, and although you need to work it a little bit harder, it makes it more difficult to use too much and waste any excess. Where the Gold Class really shines, is the shine. It’s arguably got the greatest shine, so it’s employed by many car enthusiasts who want their baby to really radiate and make sure everyone notices. If you have any black plastic trim on your vehicle, be careful as it can leave some white streaks. Although it won’t last as long as a synthetic, it should still give you 4-5 months of coverage. 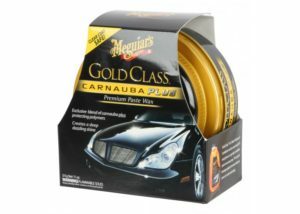 Despite its a fairly small container, it should last you about 3 waxes on a typical car. If you want a classic product with superior shine, this is the one for you. Good For: Those who don’t mind applying more often. Amazing shine, great protection and good for all colors. P21S is in our runner-up slot for carnaubas, but it could just as easily be in the top spot. The only reason that we’ve ranked it lower is because it’s a fair bit more expensive than Gold Class. Otherwise, it provides equally (though potentially slightly better) treatment to your vehicles. P21S is a little thinner, so it’s easier to apply which is great since you won’t spend all afternoon working it in and getting tired arms. As well, it dries much quicker and is much easier to remove, saving you valuable time. Despite the thinness, a little bit goes a long way with this wax. We also tend to find that it lasts a little bit longer than Gold Class, around 5-6 months. And, it has that amazing carnauba shine. Like we said, the only drawback is the price, but if you’re willing to pay a little more for the premium quality, you won’t be disappointed. There are two commonly types of waxes used: carnauba-based waxes and synthetic waxes. 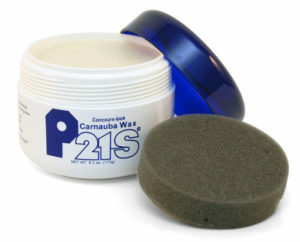 Carnauba waxes are produced from the leaves of a Brazilian palm tree. 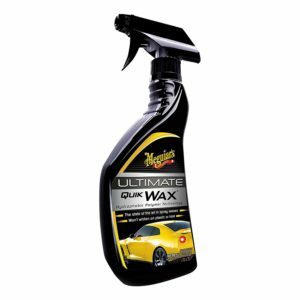 These waxes produce glossy, protective finishes on your vehicle. It’s also hypoallergenic, though typically mixed with other softer waxes like beeswax to make it easier to use since it’s normally quite brittle. Carnauba is considered the premium solution based on its shine, but tends to be more expensive than synthetics. Synthetic waxes by comparison are produced from man-made chemicals, which has its own set of benefits and drawbacks. For one, they are often easier to work with, often available in a spray-on formula, and thinner, making them more easily worked in. They are also cheaper, since they don’t need to harvest it from the specific tree. They may also have higher melting points, so if you live in very hot areas, it may be better to use synthetic. However, they don’t provide quite the same shine that carnaubas will. Synthetics are often called paint sealants, since they’re not technically waxes. The last thing to consider between carnauba vs. synthetic is that synthetics will last longer than carnauba. In general though, serious enthusiasts will often swear by carnauba since 1) they get to frequently wax their prized possession and 2) the unbeatable shine. If you just care about having the long-lasting protection, synthetic may be better for you. At the end of the day, both will provide good protection and shine or your vehicle, and it’s really a matter of personal preference. How to Actually Use Car Wax! Now that you’ve picked out and ordered your new car wax, you need to know how to use it. There are tons of guides out there on the internet to check out, but these are a few tips to consider, and be sure to check out this WikiHow guide and the video below for some tips on technique. 1. Make sure your vehicle is both clean and dry, using a mild detergent and a decent gentle scrubber but not one that can scratch your vehicle. 2. Although movies and TV shows often show people waxing their cars outdoors, doing it indoors is better. Direct sunlight can alter the final product since it can produce uneven heating in different parts of your vehicle altering how much wax gets soaked in, and may leave a residue. 3. Split your vehicle into sections, and wax each section one at a time. 4. Follow the manufacturer’s instructions. This may seem pretty basic, but each product is a little different and should be used accordingly. These are just some general tips!